The global 3D printing market has been accumulating lucrative opportunities owing to the rising use of technology. The growing awareness about the uses and the benefits of the 3D printing in place of indigenous manufacturing methods will further add to the growth of the market. In addition, continuous innovation in technology and services and devices based on it are also forcing in adopting the changing technologies. 3D printing has simplified ways of working in the manufacturing sector, customization of products, styling, and designing all have grown adequately. High material cost and lack availability of standardized process may slow down the growth of 3D printing market. However, by imparting more knowledge about the 3D printing technique, growing uses in jewelry making, designing printed electronics and in various other areas the market will flourish in forthcoming years. The global market for 3D printing has created lucrative opportunities for the players. The market valuation is expected to cross US$ 32.3 bn by the end of 2025 that was US$ 7.3 bn in 2016. The market is projected to expand with an impressive CAGR of 18% during the forecast period between 2017 and 2025. These analyses will help the players to take better and well-evaluated decisions for their business to grow effectively. The global 3D printing market is categorized on the basis of use, technology, and application. By considering the use of 3D printing, this category is bifurcated into commercial use and personal use. Rapid growth in manufacturing, mass customization, rise in prototype, and bulk production are the factors responsible for using 3D printing for commercial use. As of 2016, this segment held more than half of the demand shares and the revenue was US$ 5.93 bn. As per technology, the market is segmented into polyJet, stereolithography (SLA), selective laser sintering (SLS), fused deposition modeling (FDM), and others. Among these, polyjet is leading the market and accounts for 41% of the total market share. In terms of volume, the FDM segment holds the highest number of shares. This dominance is due to the higher preference for personal and commercial use of FDM printers. The application of FDM is also significant in various industries ranging from automotive to consumer goods. Based on application, the 3D printing market is segmented into medical, industrial and business machines, education, consumer products and electronics, architecture, automotive, aerospace, military and defense, and others. From all these segments, consumer products and electronics are dominating the market followed by the automotive sector. The growth in 3D printing is expanding in the automotive sector as it is highly used for printing interior parts such as gearbox handle, gears, engines, shafts, brakes, and spare parts. It is also used to print external parts such as doors, window frames, steering handle, body parts, head, and taillights. The growth of the 3D printing market is projected to dominate in North America as the region holds a leading position by using this technology at a high rate. As the prominent players of the market are established in the U.S. this factor is acting as the major driver with which North America is leading the global market. Growing awareness about the benefits of using 3D printing mainly in the household and commercial sector. The second region to lead after North America is Europe. Italy, Germany, France, and Sweden are the major countries offering lucrative opportunities for the players to grow in the 3D printing market. Emerging countries are also showing high growth results for 3D printing. According to the analysis, Asia Pacific displays by the far the best CAGR during the forecast period among all the regions. The Asia Pacific is projected to reach a valuation of US$ 8.2 bn by the end of 2025. The report also gives a complete market analysis in which there are three players holding strong position namely, Solidscape, Inc., Stratasys, Ltd., and EOS GmbH. Some of the other key players are also mentioned such as Concept Laser GmbH, Arcam AB, Voxeljet Technology GmbH, SLM Solutions GmbH, and ExOne GmbH. 3D Printing Market report provides analysis for the period 2015 – 2025, wherein the period from 2017 to 2025 is the forecast and 2016 is the base year. The report covers all the major trends and technologies playing influential role in the 3D Printing market’s growth over the forecast period. It also highlights the drivers, restraints, and opportunities expected to impact market’s growth during the said period. The study provides a complete perspective on global 3D Printing market’s evolution throughout the above mentioned forecast period in terms of revenue. The market overview section of the report demonstrates the market dynamics such as the drivers, restraints, and opportunities that influence the current nature and future status of this market, key indicators and trends. An attractiveness analysis has also been provided for every segment in the report, in order to provide a thorough understanding of the overall scenario in the 3D Printing market. Moreover, the report provides an overview of various strategies adopted by the key players present in the market. Key market indicators included in the report provide significance of the factors which are capable of changing the market scenario. These indicators are expected to define the market position during the forecast period. This report provides all the essential information required to understand the key developments in the 3D Printing market, growth trend of each segment and companies’ strategies to efficiently compete in the market. Also, the report provides insights related to trends and its impact on the market. Furthermore, Porter’s Five Forces analysis explains the factors which are currently affecting the 3D Printing market. This report also provides the ecosystem analysis for the 3D Printing market which explains the participants of the value chain. The report segments the market on the basis of use, technology, application, and regionally. By use the market is further segmented as commercial and personal. On the basis of technology, the market is segmented into PolyJet, Fused Deposition Modeling (FDM), Selective Laser Sintering (SLS), Stereolithography (SLA) and others. On basis of application, the segments of this market include consumer products and electronics, automotive, medical, industrial, aerospace, military, architecture, education and others. The report provides in-depth segment analysis of the global 3D printing market, thereby providing valuable insights at the macro as well as micro levels. The report also highlights the competitive landscape of the global 3D printing market, thereby positioning all the major players according to their presence in different regions of the world and recent key developments initiated by them in the 3D printing market. The comprehensive 3D printing market estimates are the result of our in-depth secondary research, primary interviews, and in-house expert panel reviews. 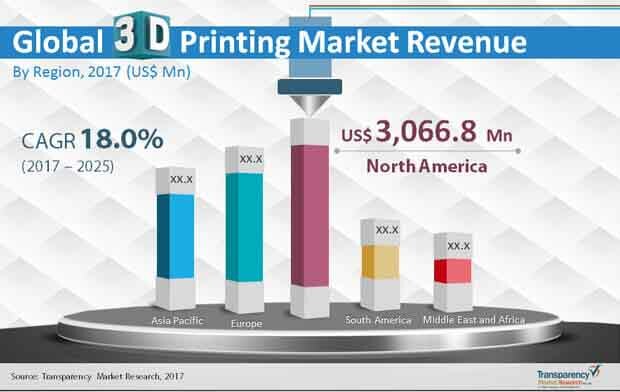 These market estimates have been analyzed by taking into account the impact of different political, social, economic, technological, and legal factors along with the current market dynamics affecting 3D Printing market growth. Stratasys, Ltd., 3D Systems, Inc., Solidscape, Inc., EOS GmbH, ExOne GmbH, Optomec, Voxeljet Technology GmbH, Concept Laser GmbH, Arcam AB, SLM Solutions GmbH, among others, are some of the major players operating within the 3D Printing market profiled in this study. Details such as financials, SWOT analysis, business strategies, and other such strategic information pertaining to these players have been duly provided as part of company profiling.